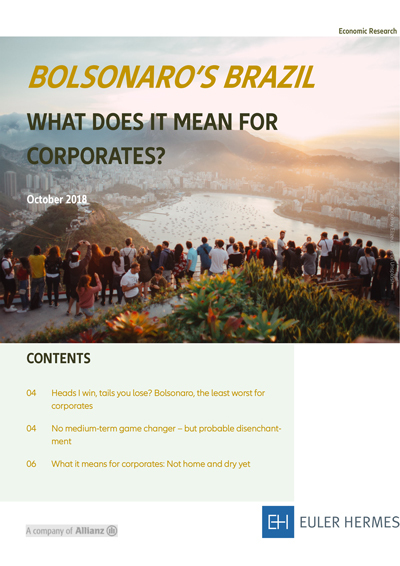 You are here: Home / Media Center / Bolsonaro’s Brazil: What does it mean for corporates? President-elect Jair Bolsonaro and his outwardly pro-business policy platform are the “least worst” choice for corporates. In the short-term, we expect quick wins with reforms that only need a simple majority in Congress. These reforms will appeal to a broad pro-business and conservative audience. Bolsonaro’s business environment reform could also lead to the creation of 90 000 additional companies in 2019 compared to 2018. The positive conﬁdence shock could add roughly +0.3pp to economic growth over the next year. Yet, the relief for corporates could be short-lived. The comeback of market volatility and increase in risk premium, and hence borrowing costs, is right around the corner.